With football legends like Alfredo Di Stéfano, Mario Kempes, Daniel Passarella, Maradona, Jorge Valdano, Claudio Caniggia, Gabriel Omar Batistuta, Ariel Ortega and Javier Zanetti, Argentina can pride itself as one of the best nations in the world producing world class football players. In the list of legends we can of course include Lionel Messi to the list despite he has still a long career to enjoy. In fact, we could mention tenths of other Argentinian football players who have wore the ‘La Albiceleste‘ national team shirt or have made their remark in the history of football. Next year it will be 30 years since Argentina won their second and currently last FIFA World Cup trophy. The Primera División of Argentina features some of the worlds best clubs in youth development. Clubs like Boca Junior, River Plate, Velez Sarsfield, Independiente and San Lorenzo have all developed some of the best players in football in recent years. But football in Argentina is a lot more than it’s top tier, despite it’s not as famous. In my perspective an Argentinian youth development save would be the ultimate challenge of Football Manager. Not only because of it’s challenge but also because of the historical aspect of developing future world class football players. With one of the highest youth ratings in Football Manager 2016 the foundation to get great players from the annual youth intake is there. Thanks to dedicated persons like Bacorales, part of the Sports Interactive Argentinian research team and member of the SIGames forum, we give you the chance to download the complete Argentinian football league system down through regional divisions. The Football Manager 2016 Argentinian Lower League database unlocks Primera Metropolitana B, C and D, Torneo Federal A (tier 3), B (tier 4) and C (tier 5), and the regional division. It features real stadiums, created players and staff added for clubs in the middle divisions, made by the official research team for the official Football Manager 2016 database. It’s a real honour to present to my European audience one of the most immense custom databases created to this date for Football Manager 2016. Download the Argentinian Lower League Database by Bacorales and start a new Football Manager 2016 save in the lower division of Argentina. For an outsider the Argentinian league seems highly complex with both professional leagues and regional leagues. Bare with me, and I hope I explain this right, how the league is structured in real life and what is featured in the Football Manager 2016 Argentinian Lower League database by Bacorales. The league starts 19th of December as early pre-season selection date and ends mid November with regular league matches. 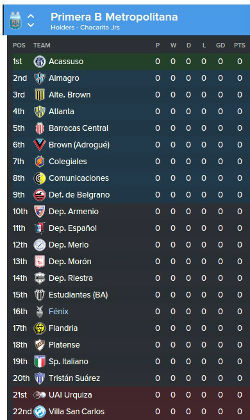 The Argentinian football league structure is split into two different leagues below the Primera B Nacional (known as second division if not using a real name fix), which is already included and active in the official Football Manager 2016 database. This update unlocks the remaining leagues and its sub-divisions from the Primera Metropolitana B to D, the Torneo Federal A to C and 11 of the 105 regional divisions of 6th tier. It completes the league system of Argentina in Football Manager 2016 – featuring an immense number of 26287 database changes of version 1.6. On one side of the league system below Primera B Nacional is the Primera Metropolitana (B to D), which features clubs from the Greater Bueno Aires area – this means clubs from Bueno Aires and its nearby province. The area of Greater Buenos Aires has a population of over 12 million people, almost 1/4 of the entire Argentine country. The Primera Metropolitana and its clubs are directly affiliated with the Argentine Football Association. While the Primera Metropolitana features clubs from the region where football was first established in Argentina when English immigrants came to the country in the 1840s, Torneo Federal consists of hundreds of indirectly affiliated clubs of the AFA. Here are clubs from all other regions of Argentina put into several local leagues. You can think of the Torneo Federal A to C as a regionalised league containing clubs from all over Argentina except those clubs from Greater Bueno Aires. Clubs playing in the Torneo regionalised leagues can not be promoted or relegated to the Primera Metropolitana leagues, and vice versa. The Primera B Metropolitana is one of two leagues in the third tier of Argentinian football league system, the other is Torneo Federal A. The Primera B has 22 clubs playing eachother two times in a season, where bottom 2 will be directly be relegated to Primera C Metropolitana which features 20 clubs and equals to Torneo B (fourth division). In the Primera B Metropolitana can clubs like Club Almirante Brown, Club Atletico Defensores de Belgrano (a feeder club of River) or Club Sportivo Italiano be found – some interesting clubs to play as. While the former was a Primera B Nacional club at one point, Sportivo Italiano were founded by Italian immigrants 60 years ago (1955) and plays in the same colours as the Italian national team. The bottom league of Primera Metropolitana is the division D which has only 15 clubs. On the paper the league structure of the Primera Metropolitana seems more straight-forward and easier to gain promotion from than the league structure of Torneo Federal. Here I can also mention that the league rules of Primera Metropolitana is around 99% authentic and is the one I recommend to manage the most in. As mentioned earlier the Torneo Federal consists of clubs from all over Argentina. The Torneo Federal A can also be recommended to play in as it features 4 groups of 10 teams. The two best clubs will play a promotion group stage, while the bottom 2 will be relegated to Torneo Federal B. At the fourth tier, also known as the Torneo Federal B, you have 12 groups of 11 to 12 clubs depending on the group. A total of 134 clubs will compete for a limited amount of spots to promote for Torneo Federal A. 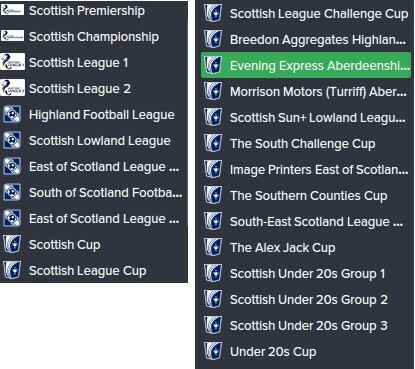 This is not 100% accurate but has been made playable to Football Manager 2016 due to its complexity in league rules and match structures (play off, promotions and relegations). While the original regional leagues of the Torneo C has 4 clubs playing eachother once in real life, meaning that clubs may only play 3 matches in a season, this custom database has 160 playable clubs where 12 to 13 clubs are split into 12 groups. In real life there would be 288 clubs divided into a lot smaller groups – meaning the amount of matches would not be more than a handful. So in order to make the league a bit more interesting clubs will play in bigger groups. At the bottom of the league structure exists the Regional Division. In the FM 2016 Argentinian Lower Leagues database by Bacorales you will find 11 provincial or regional leagues. A total of 445 clubs from choose from is hopefully enough for you to pick from. Yet again, the lower leagues of Torneo Federal and the Regional Division is not 100% accurate but surely playable and hopefully challenging enough for you. 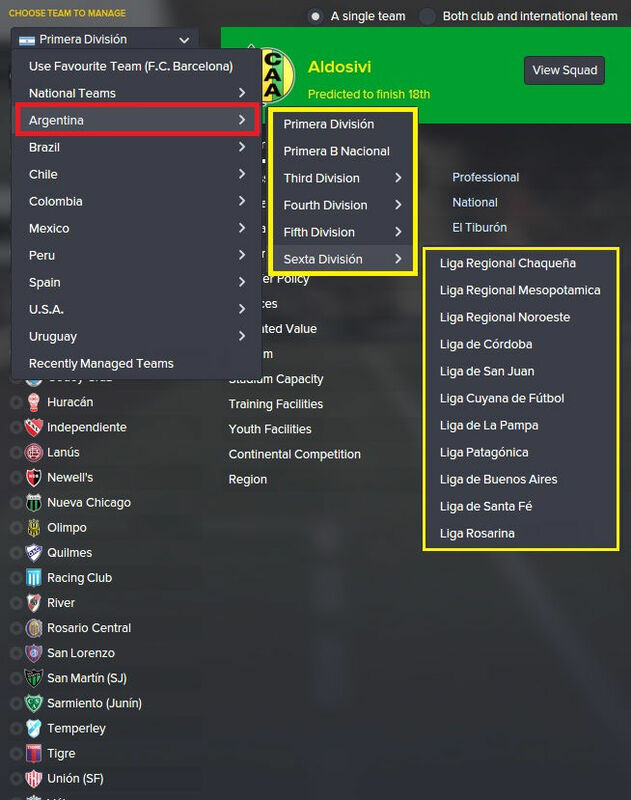 Personally I’m sure you will be able to test your managerial skills in the ultimate lower league management challenge in South America – the perfect chance to hunt from back to back promotion from the very bottom of a nations league system similar to the coming English Lower Leagues Level 23 database which will be available like last year on this very website – a little teaser for you there! We hope you will enjoy this custom database as lots of work has gone into created this database. The FM 2016 Argentinian Lower League database Level 6 will be updated continuously for the next months and more precisely after the 16.3 database in or around the beginning of March. The minor improvements and changes that will be done is updating average points relegations, other database improvements (regional groups in Torneo Federal Tournaments, more real stadiums added, shirts and etc), fixtures and dates changes, real Copa Argentina structure and so on… – since there are a lot of Argentinian clubs with very little data included on FM 2016. Unlock the complete football league system of Argentina with this magnificent and in-depth FM 2016 Argentinian Lower League Database by Bacorales of the official Football Manager Argentinian Research Team. Thanks to Bacorales of the official Football Manager Argentinian Research Team who has put immense work and time to create a realistic as possible lower league database for Argentina. Passion4FM are proud to be able to present the magnificent work put into this database and for all the effort put into it. For any specific requests, questions or troubleshooting issues please contact the creator Bacorales on the official SIGames forum thread. Thanks to the Argentinian Research Team as well who year by year works on improving the leagues of Argentina and its player and staff database – increasing the amount of data needed so we can enjoy the lower leagues of Argentina, not only the second division, but also for those tiers that is not active by default – ultimately making this lower league database as massive and in-depth as it currently is.